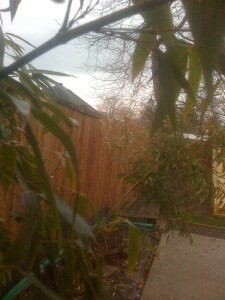 Despite numerous warnings that I was insane to even contemplate the idea, I planted bamboo in my backyard. And not even the relatively safe kind, i.e. ‘clumping’ bamboo. No, I planted the ravenous, crawl into your house in the middle of the night and kill your pets kind of bamboo. The Day of the Triffids bamboo: timber bamboo. That’s how most of my conversations went. But I did it. It’s done. And so far, all my pets are still here. Or, well, they didn’t die of bamboo related injuries, at least. I can’t say the same for my poor bamboo though. I did my research, you know. Like I said, I surrounded the planting area on two sides with concrete. The other two sides, a foot and a half deep bamboo barrier, especially made for the task. I planted them in little mounds, so the runners would be easy to spot. I fertilized only the top six inches of soil or so, so the runners would stay close to the surface and be easy to maintain. I check all the runners twice a year, and trim the ones that are heading in the wrong directions. I did not, however, protect them from my dog. I started with 3 bamboo. Two black and one tiger, just like I wanted. (Interestingly, both are classified as Phyllostachys nigra.) Jessie and I drove waaaay out to Hillsboro to the Bamboo Garden Nursery (Yes, Jessie and I did meet Oggie the Bamboo Dog). We were driven around the woods in a golf cart by the nice and helpful bamboo guy, who helped us pick out two black bamboo and one tiger bamboo. We carefully drove them home, planted according to directions, watered and carefully watched over my new charges. Well, watched them except while I was at work. I guess Jessie was still in her destructive stage, because it wasn’t long before one of the black bamboo was ripped out of the ground. And replanted. And ripped out again. And replanted again. And ripped out AGAIN. And replanted, but by this time, it was becoming clear that the poor thing had met its match. Eventually I had to admit that the plant was dead, and had now become a doggy chew toy. Now, I have a fence around my bamboo. They’re probably safe at this point, but I’m not taking any chances. I have since replaced the unfortunate black bamboo with some free golden timber bamboo that I found on craigslist. One of my favorite things to do around this time is to look for all the new little bamboo shoots popping out of the ground, letting me know that my mission of creating a privacy screen between me and my neighbors is coming to fruition. Apparently my endless reserves of patience do not extend to plants. Or actually, weather. Because you know once the weather warms up for a couple weeks, those bamboo are going to be all crazy in yo face growing fiends. Unkillable. Unstoppable. With poisonous whip-like stingers. Hmm…perhaps I should get a really big machete. You know, just in case. Plus, it gives me an excuse to go to Andy and Bax! Stay tuned for the next chapter, wherein my bamboo start growing at a rate of 2.65 feet a minute for the entire summer, and I next complain that they’re growing too damn fast. Yay, gardening! This entry was posted in Canine Frivolity, Literary Pursuits, Movies & TV, The Eternal Project and tagged a tale of two cities, andy and bax, bamboo garden nursery, bamboo maintenance, day of the triffids, jessie by Morgan. Bookmark the permalink. No excuses needed to go to Andy and Bax, you always need something there right? But you may want to take Kung Fu to learn some flying twirling leap kicks for when your fighting the bamboo with that machete.